We have often been asked about what do we do with scrap glass, and in particular, broken pieces. “Can we recycle the glass?” YES, we can, to a point. 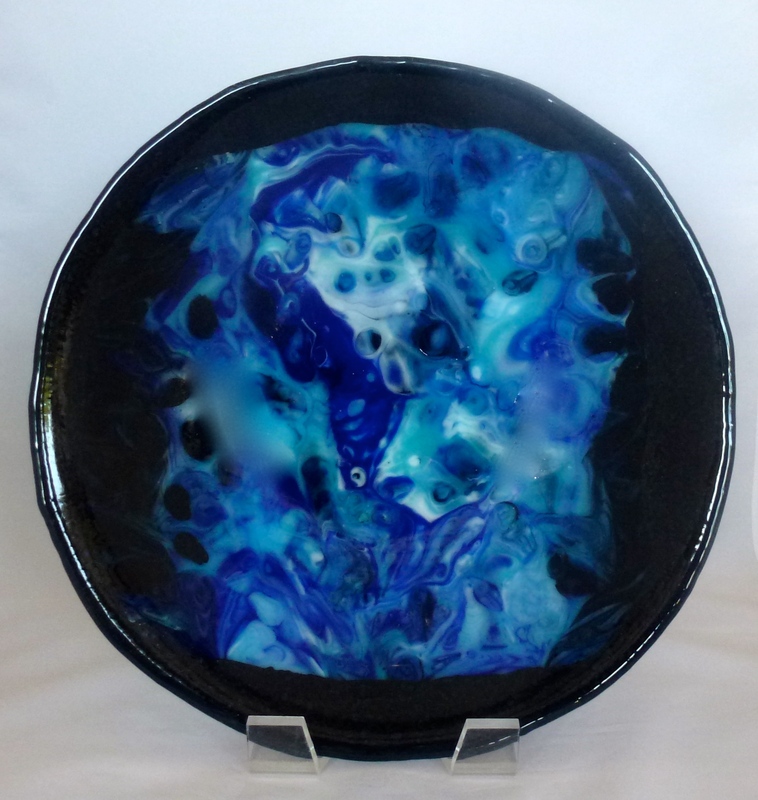 There are a limited number of times the glass can be fired before it starts changing properties… either in terms of color and/or its ability to properly fuse with other pieces of glass. In making a piece of glass art (a bowl for instance) we typically fire it three times. The first firing is the initial fusing of the glass piece. This is often followed by a second firing to correct surface issues in the first and/or to add some additional interest. 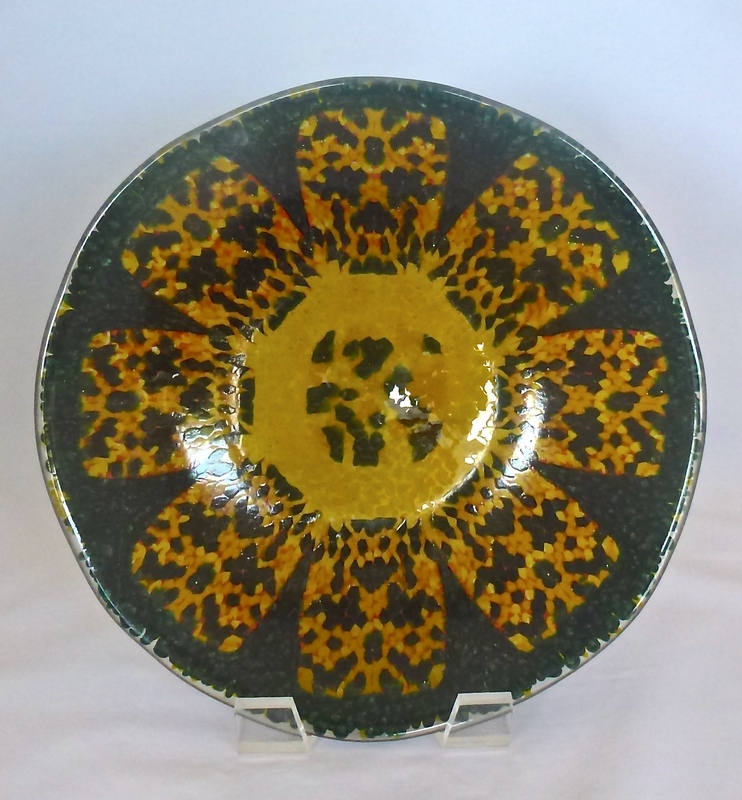 The final firing is to shape (or “slump”) the piece. You typically don’t want to go beyond five or six firings max. 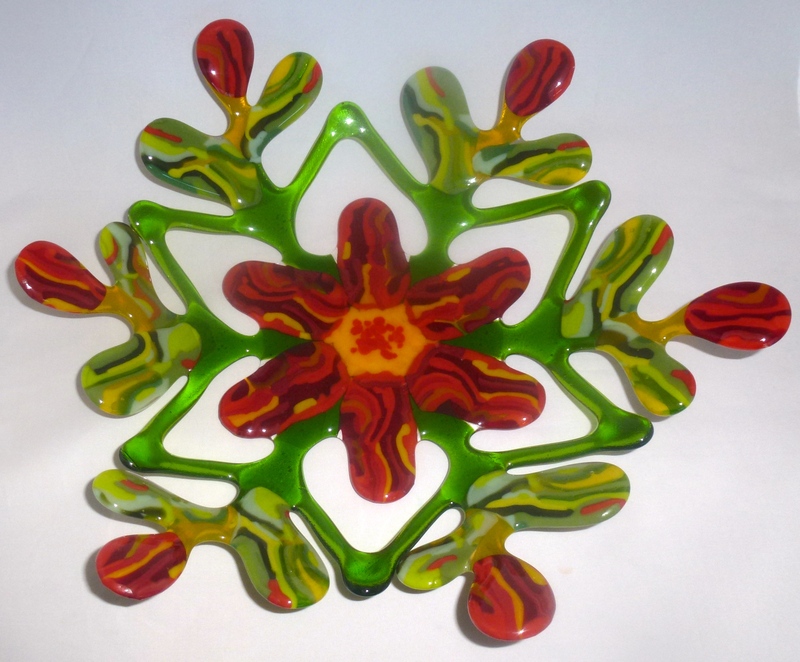 So, if a piece is dropped and breaks, there is the possibility of reusing the glass, albeit to create a new piece. (Those of you that follow Rick Strini’s work can see how he has made beautiful bowls from reclaimed broken pieces of blown glass.) Below are two examples of broken pieces that we have resurrected and two others that had surface issues where multiple firings couldn’t cure… until we finally figured out a simple way to save them from the scrap pile. The first one was a Carousel Basket (“Ring Around the Rosie” by Bob which can be seen in our November What’s New entitled “It’s Been a While”). Someone in Chicago initially purchased the piece and had us send it to them. Unfortunately, I didn’t do a good job packing it, plus it wasn’t a good structural design. I clearly failed Packaging 101 and Structural Engineering 101. It arrived in Chicago with one broken leg. When they sent it back to me, it arrived with 5 broken legs! So, I deconstructed it, added some additional ribbing not in the original piece to enhance structural integrity, and voila…created “Posie Dance Resurrected” shown in the first photo. Oh, by the way, I’ve improved my packaging technique! The second photo is a piece created by Sandy. Actually I contributed to it… I accidentally dropped a beautiful bowl of hers that shattered into a zillion pieces. I confessed to the mishap and wrote a blog entry about it (“OMG!! She’s Going to Kill Me!” …August 2014). In the blog you can see the beautiful original piece. Some of the glass was put in a drop pot with additional blue glass. It created a bowl that someone purchased at our Maui Open Studio event in February. The remaining pieces were arranged on a screen drop that resulted in the squarish center section of piece in the photo. 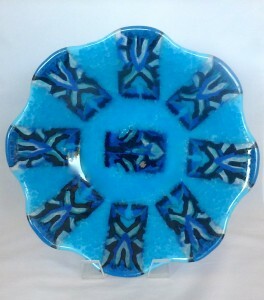 Sandy surrounded the square with Blue Adventurine frit (chips of glass) to make it circular and ultimately the bowl in the photo. The third and fourth photos are examples of beautiful bowls that resulted from resurrecting glass from the “what can I do with this?” pile. Both pieces are pattern bar creations by Sandy that had all kinds of surface issues. Multiple re-firings were attempted to no avail. The issues seemed beyond repair. The pieces had been put aside for over a year until we decided to give them one more shot by careful re-firing and glass augmentation. First she did the yellow and green one. 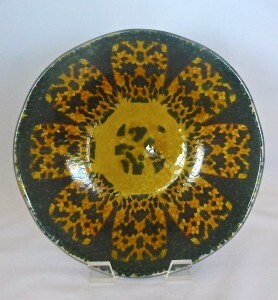 After drilling out surface issues, Sandy covered the piece with transparent marigold yellow frit. Much to her pleasant surprise, her new technique resulted in a perfect piece. 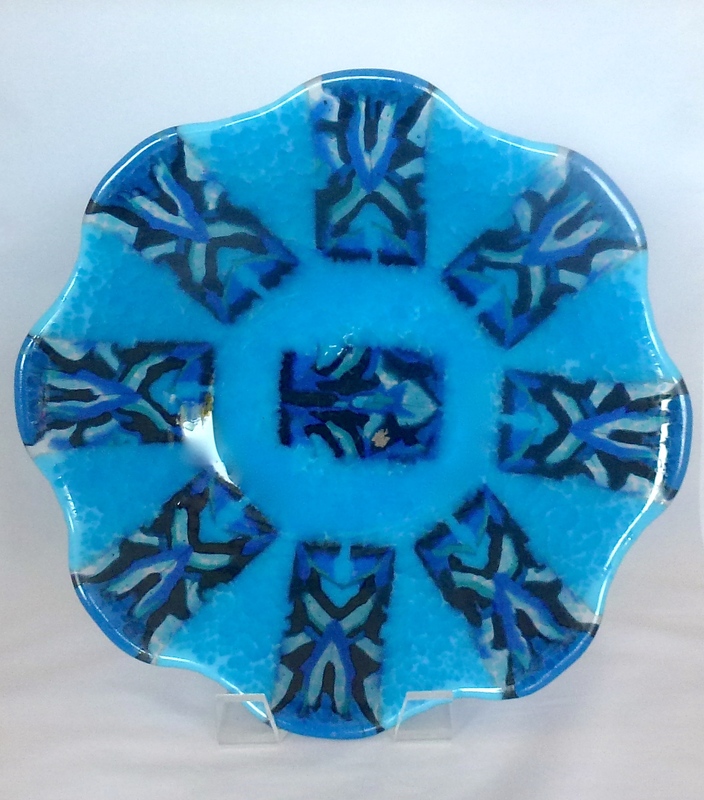 She used the same technique on the second pattern bar piece, using transparent light turquoise frit, and it again turned out beautifully… two pieces snatched for the “impossible to fix” pile. So, bottom line, yes glass pieces can be reclaimed, recycled, resurrected… some easier than others… but hope for all.